Ms. Bodendorfer represents clients in litigation and resolution of complex matrimonial and family-related matters. She handles all aspects of family law representation, including dissolution, parentage, pre- and post-nuptial agreements, child custody, visitation, support, property division, post-dissolution concerns, and appeals. 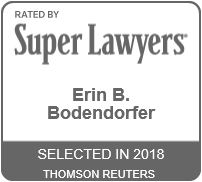 Every year since 2015, Ms. Bodendorfer has been recognized by her peers and named a “Rising Star” attorney by Illinois Super Lawyers magazine, a designation limited to less than 2.5% of lawyers fewer than 40 years of age in the State of Illinois. 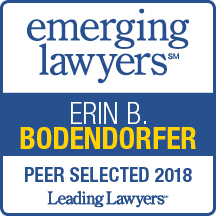 In 2017 and 2018, Ms. Bodendorfer was named an Emerging Lawyer in Family Law by Leading Lawyers. Ms. Bodendorfer is a member of the American Bar Association, the Illinois State Bar Association, the Chicago Bar Association and the Women’s Bar Association of Illinois. She is also a member of the Chicago Public Library Foundation’s Associate Board, which provides fundraising for the Chicago Public Library, and she previously served as the Board’s communications chairperson. Ms. Bodendorfer is also on the Planning Committee for the Women Everywhere Project, which coordinates and hosts service days at various non-profit organizations and educational days for local high school students in several Cook County Courthouses annually. In addition to her practice, Ms. Bodendorfer has played an integral role in the passage of Public Act 99-90, the rewrite of the Illinois Marriage and Dissolution of Marriage Act, which was effective on January 1, 2016. The update to the statute brought a much needed overhaul to Illinois’ divorce and related family laws, as the prior outdated act was enacted in 1977. As a result of her accomplishments in her practice and knowledge of the law and the new statute, Ms. Bodendorfer was appointed in 2015 to serve on the Cook County Circuit Court’s Domestic Relations Division’s Rules and Forms Committee. The Committee updated the Cook County local rules and forms to conform to the changes in the statute. In addition, Ms. Bodendorfer has published articles and lectured on the topic of the rewrite of the Illinois Marriage and Dissolution of Marriage Act, of which she is exceptionally knowledgeable. Ms. Bodendorfer has practiced exclusively in the area of matrimonial and family law. Her prior experience includes clerking for nearly two years during law school at a major family law firm in Chicago and working as a 711 licensed student clinician at Loyola University Chicago School of Law’s Civitas Child and Family Law Clinic. Through the Clinic, she represented children as a guardian ad litem in the Child Protection Division and as a child representative in the Domestic Relations Division in Cook County. While in law school, Ms. Bodendorfer also worked as a teaching assistant, as Public Interest Law Initiative intern at Equip for Equality in its civil rights department, and as a law clerk at Northern Trust. In addition, she served as staff editor of the Loyola Consumer Law Review and was awarded a merit scholarship upon entrance to law school and a CALI Excellence for the Future Award in Legal Writing. Ms. Bodendorfer also received a certificate in tax law upon graduation from law school and focused her law school studies on family law, taxation, and trust and estate planning. 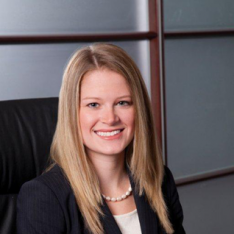 Ms. Bodendorfer joined Katz & Stefani in 2012 as an associate attorney. First Comes Love then Comes Strategic Planning, Lyric Opera, February 19, 2016. Overview of the New Illinois Marriage and Dissolution of Marriage Act, CARPLS Attorney Training, November 11, 2015. Navigating the New Illinois Marriage and Dissolution of Marriage Act and Parentage Act: College Expenses and Support For a Non-Minor Child With a Disability, Cook County Domestic Relations Division and Women’s Bar Association of Illinois, October 1, 2015. Nontraditional Family Law in Illinois: Legislative and Caselaw Update and Ethical Considerations, Half Moon Legal Education, March 25, 2015. Ms. Bodendorfer is admitted to practice in Illinois.